Paris is full of theaters, cinemas and bars in different neighborhoods. But what are the unusual evenings to discover in Paris? Here are some addresses of good plans to do to visit Paris otherwise. Every Friday and Saturday night between 10pm and midnight, the Galande Studio proposes the adaptation of the movie Rocky Horror Picture Show wich was released in 1975. The show is inspired by the film (actors disguised as the characters etc) and spectators are invited to participate at the show. The studio is in the fifth neighborhood and the ticket costs 11 euros. Spend an unusual evening at the Vampire Museum! This museum is full of information and objects about vampirism and Dracula. It proposes an evening in the museum with visiting conference and a meal for about 30 euros. The evening takes place between 8 pm and 1 am in the Paris suburb Les Lilas. Enjoy magic shows and free concerts at a bar called Les Cariatides in the 2nd neigborhood between 6pm and 4am. The plate of tapas is at 10 euros and the happy hours at 6 euros between 18h and 21h. The programming is different every day. 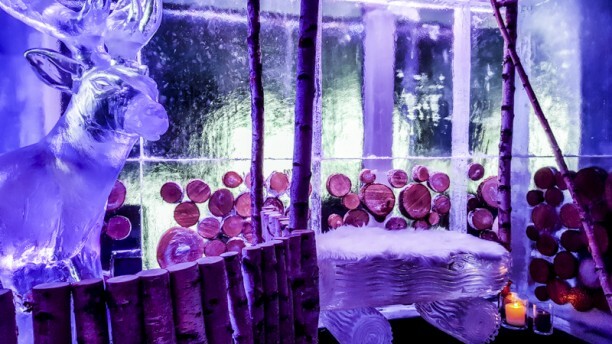 Enjoy an evening in an ice bar in a -7 degree temperature called the Ice Kube. Located in a hotel, you are provided with a down jacket, gloves to spend half an hour in this icy atmosphere in the 18th nieghborhood. The half hour costs 38 euros and includes 4 cocktails with a part of vodka. You will also listen to electro music. The bar is open between 7 pm and 1:30 am. Enjoy bare-chested barmen in a bar called Le Latin Corner in the 5th nieghborhood, open between 4 pm and 2 am and enjoy an exceptional show if you take the “server sperm” cocktail. Enjoy spending time in an unusual bar with mangas and video games. The hot and cold drinks are unlimited and the first hour costs 3 euros. Themed evenings take also place. This bar is open until 10pm. The bar “Urgence Bar” in the sixth neighborhood offers a hospital atmosphere with syringes and medicines among others. The cocktail costs 8 euros every Tuesday and Wednesday evening between 9pm and 11pm and on the first Thursday of each month you will have gifts and surprises.